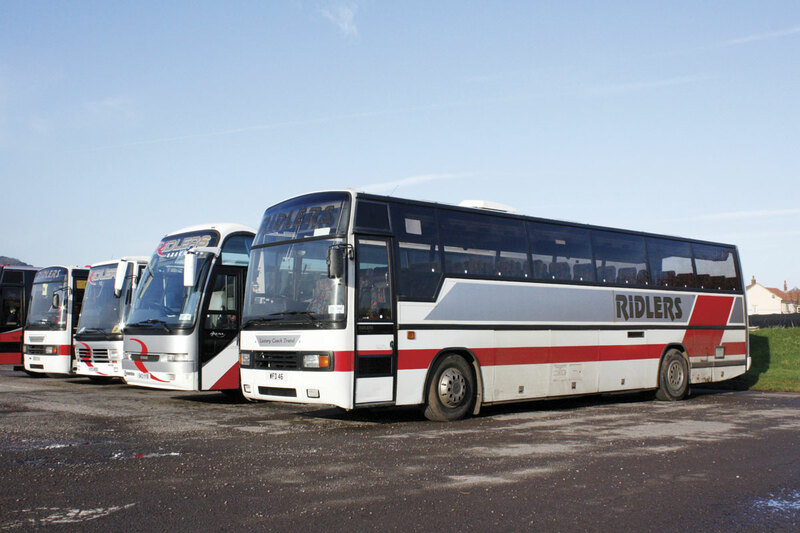 Despite the extra cleaning their presence entails, Gary Ridler, MD of Ridler’s Coaches, rather likes the swallows that dart in and out of his two depots at this time every year, though he is slightly concerned that the cat will one day catch up with a pair of doves nesting in the eaves of the Dulverton facility. 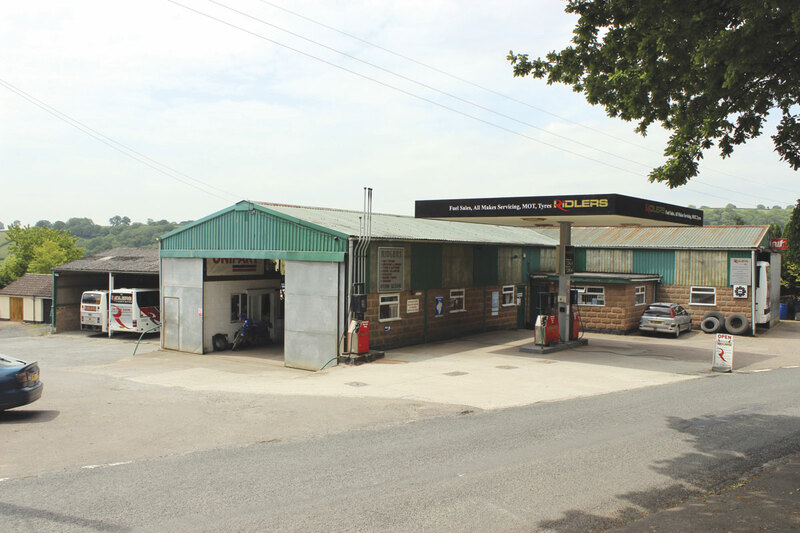 Located right on the edge of Exmoor in some of the country’s most beautiful countryside, it is fronted by a filling station and a car and bus workshop with the depot building behind and Gary’s house beyond that. 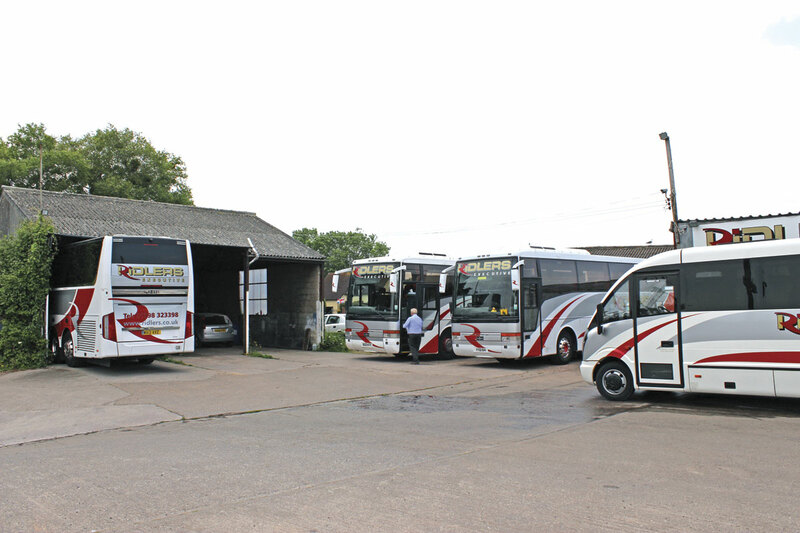 It has developed over the years and is the epitome of a country coach operator’s garage. 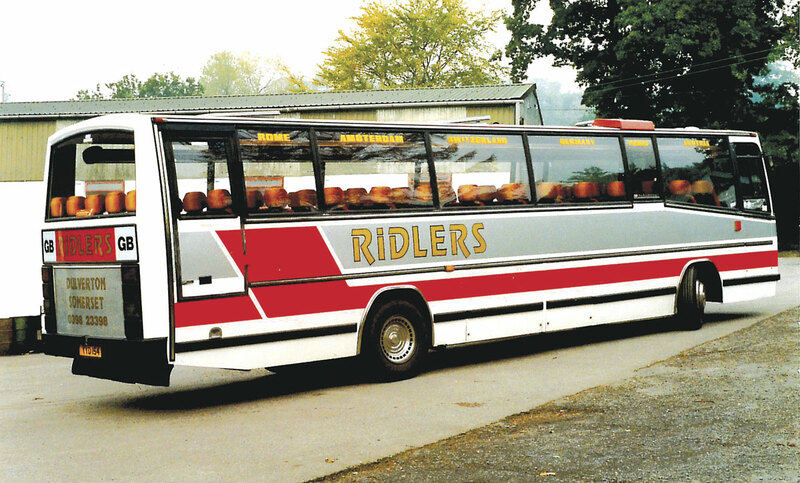 In many ways, Ridler’s Coaches is a typical rural operator because, like others that have survived into the modern era, what started as a small and very straightforward operation that relied on the immediate vicinity to generate most of its work, has grown in to something altogether different, albeit still with its roots in the local community. Even the main centre of operation has shifted 18 miles north to the Minehead area, with a depot at Williton, though Dulverton remains the headquarters and the maintenance centre. Ridler’s coach operating roots go back to just after the Second World War when Gary’s grandfather, Walter, began running an Austin 16 taxi. Walter was a countryman who helped his father to shoot and sell rabbits, also serving with the fire service during the war. 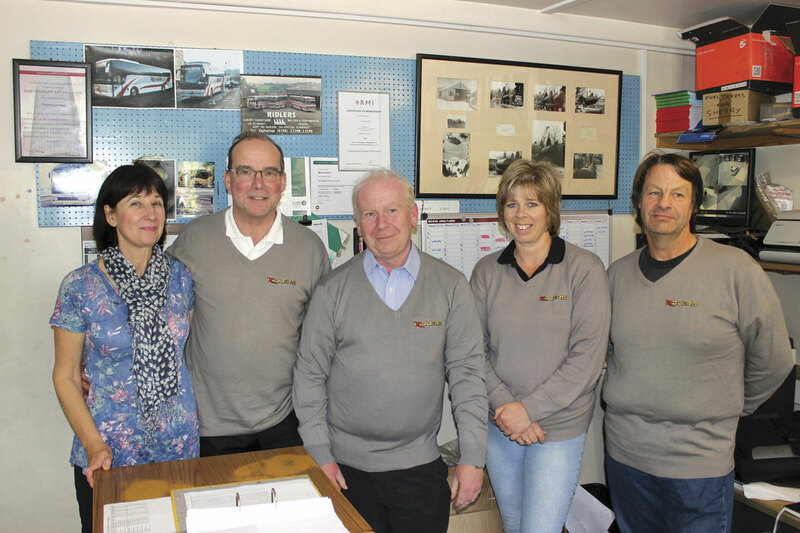 Walter’s son John joined the business after his National Service along with his wife, Doreen and around 1950 a garage and repair workshop was built on the current site in Jury Road, Dulverton. The move into coaching came as a result of the Lynton and Lynmouth flood disaster of 1952 when the Bedford coaches and riverside premises of the local operator, which Gary thinks was called Maynards, were washed away in the torrent. When they did not subsequently start again, the family saw an opportunity. 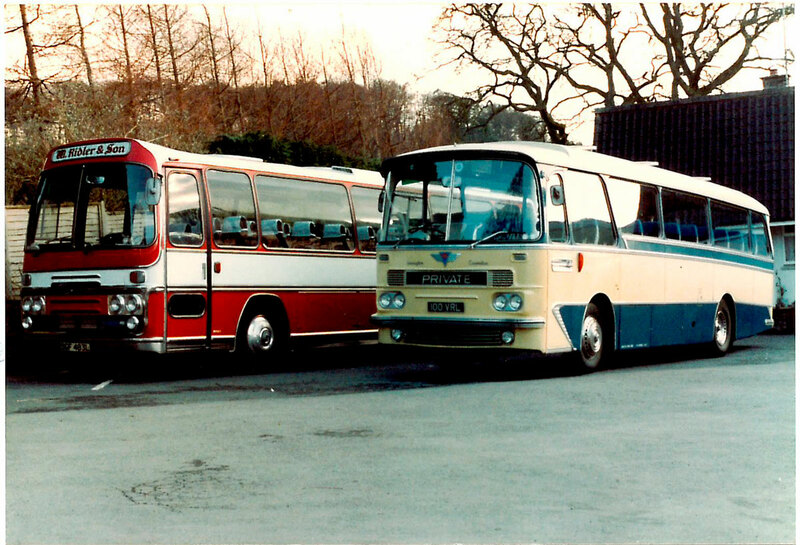 A couple of former Devon General Bedford OBs were bought and local day trips offered. Trips were advertised on a board outside the local cobbler’s shop and he also sold the tickets. 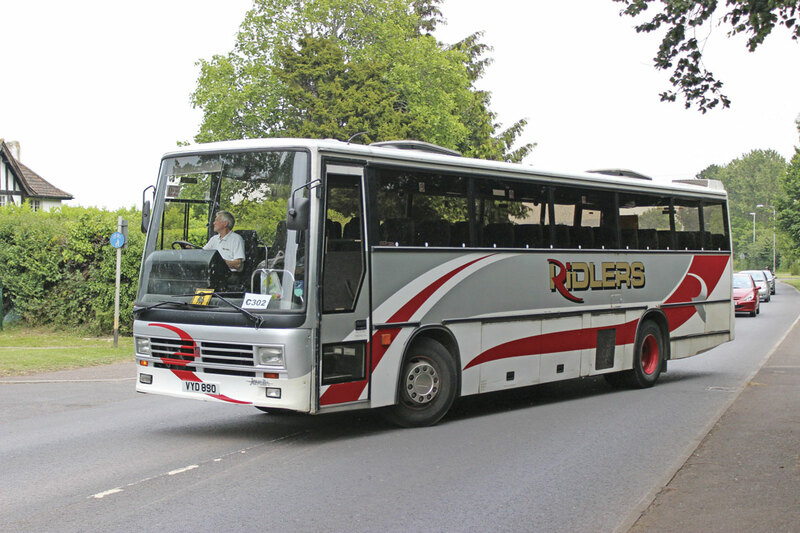 Things continued in this way until 1957 when a new Secondary Modern School was built in Dulverton, Ridler’s first school contracts were won and the fleet increased to four or five coaches. Explaining the dynamics of the business at this time, Gary said, ‘It was my Mum and Dad who ran it. Grandad worked hard but he wasn’t one for figures and making profits. My father was a very, very hard working man. My mother was the brains behind the business, the financial one who ensured things could be afforded and debt wasn’t incurred. Although they were as different as chalk and cheese they worked very well together.’ Doreen wasn’t a local girl; she had been born in Barking and evacuated to the South West the age of 12. She never went back and her whole family subsequently resettled in Dulverton. As well as the garage and taxis, another side to the business was running trucks and tractors for agricultural lime spreading. This continued until the early 1970s when Government subsidies for lime spreading ceased, after which the trucks were employed for a couple of years in the building of Wimbleball Dam before being sold. In 1972, with the coach side expanding to six or seven vehicles and the trucks still being operated, the site was redeveloped to better accommodate the coach fleet with a new open fronted garage built to the rear of the workshops. 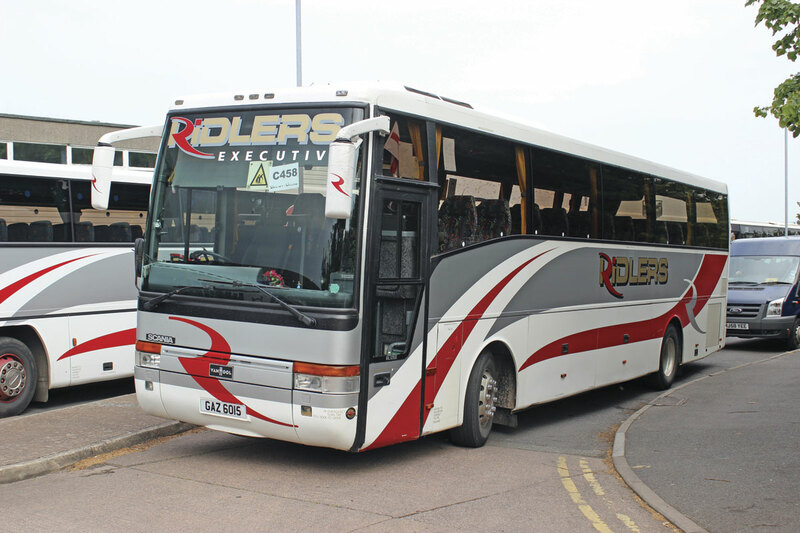 The ensuing decade saw more school contracts won, a number of them serving schools 18 miles away in Minehead, as well as a lot of weekend express work undertaken for Royal Blue and later National Express. Although he was interested in the coaching business, had obtained his PSV driving licence and helped out when he could, Gary did not join the business to begin with. He went to London University earning a degree in Mathematical Science after which he taught for two years at a school in Harrow and seven years at a school in Wellington. It was 1985, just before the introduction of the National Curriculum, that he gave up teaching and started coaching. During the 1980s the business ‘trickled on’ as it had previously with between six and eight coaches but as the 1990s came there was a new approach and a conscious decision to upgrade the fleet. 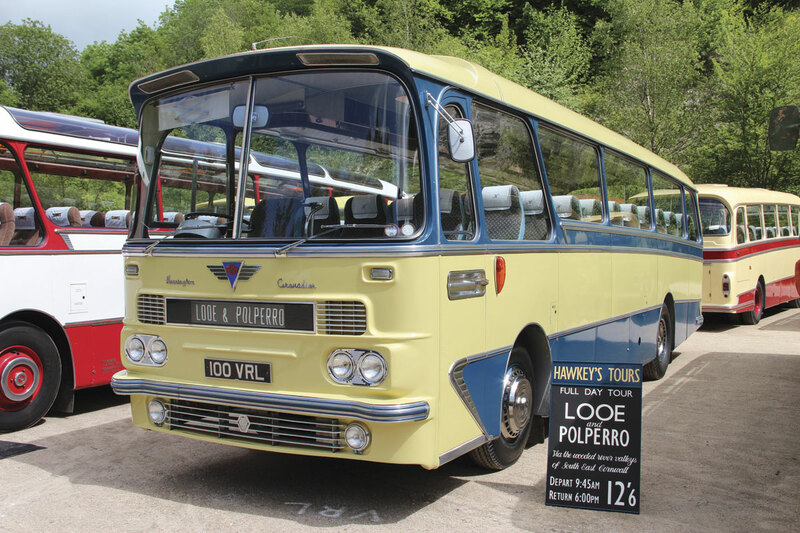 For years it had been predominantly lightweight Bedfords and Fords, though a Commer TS3 Duple was an exception and there were also a few heavyweights including a Burlingham bodied Leyland Tiger and AEC Harringtons, often purchased from Hawkeys of Newquay. The latter included a 470 engined Grenadier that has survived into preservation. Gary still has visiting rights and drove it at owner, Roger Thomas’s wedding to Jo last year. 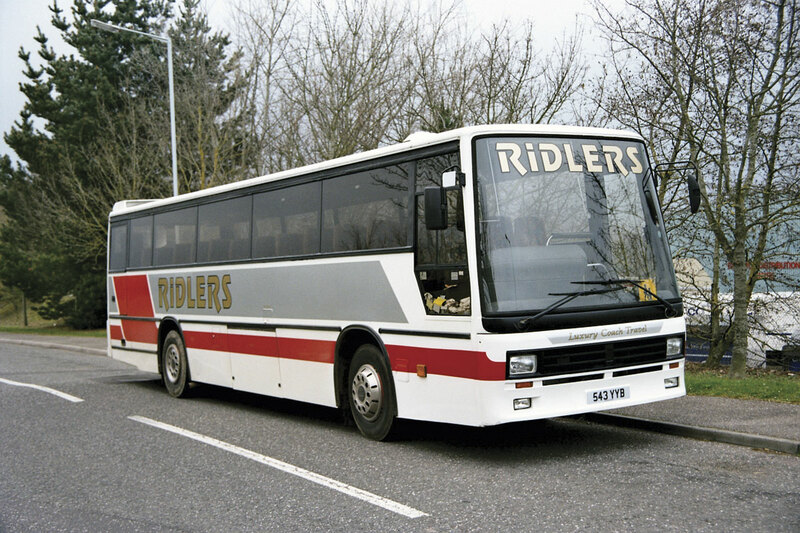 The 1980s had seen ex-Robinsons of Great Harwood Bristol LH coaches purchased as well as an RE Plaxton Elite that had been on the Isle of Man. John went out and bought a Ward Dalesman Plaxton Paramount 3200 to begin with. ‘It might not have been a mistake but maybe it wasn’t the wisest purchase from a support perspective for going abroad, although I did once take it to France on a twinning trip,’ said Gary. ‘It was an excellent vehicle with plenty of power.’ With the Dalesman came a new livery of white, silver and red, designed with only straight lines to make it easy to mask and paint in house, something the company no longer does. Before this there had been a maroon, orange and cream scheme and prior to that coaches usually kept the colours they arrived in. More mainstream was the first of two Duple 425 integrals that was purchased in 1993 from Swanbroook of Cheltenham when only five years old. It is still in the fleet today, though now it is the oldest coach owned, and has covered over a million miles without the head ever being removed from the Cummins L10 engine. ‘It really is a good engine,’ says Gary, ‘that coach doesn’t owe us a penny.’ He’d like to see it preserved eventually and is currently unsure whether to repaint it or pension it off. The second was a ZF automatic, which was fine apart from one fault found with the design in that the lightness at the front meant the box tended to push it on in slippery conditions and especially when icy. He used to put bags of sand in the forward luggage compartment to counter balance this. ‘They almost got it right with the 425. If only the build quality had been better,’ he said. 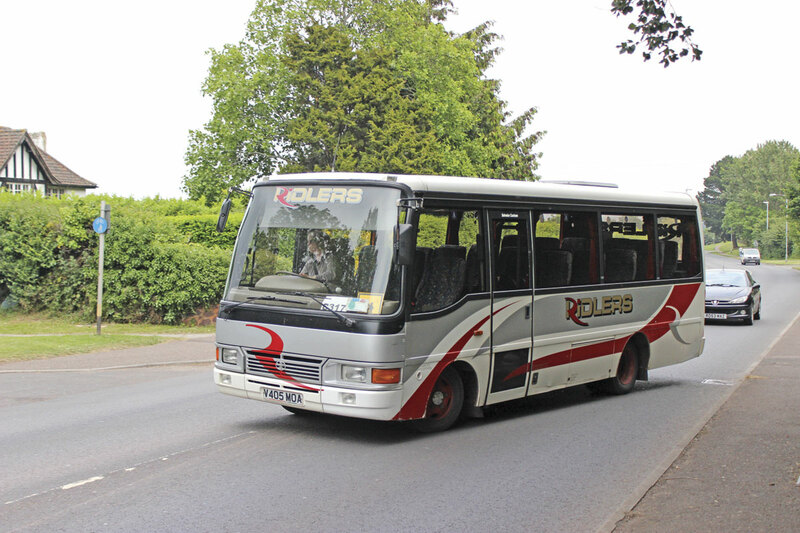 As well as the second 425, acquisitions included several Dennis Javelins and a number of Cummins engined Leyland Tigers, all of which did Ridler’s proud. 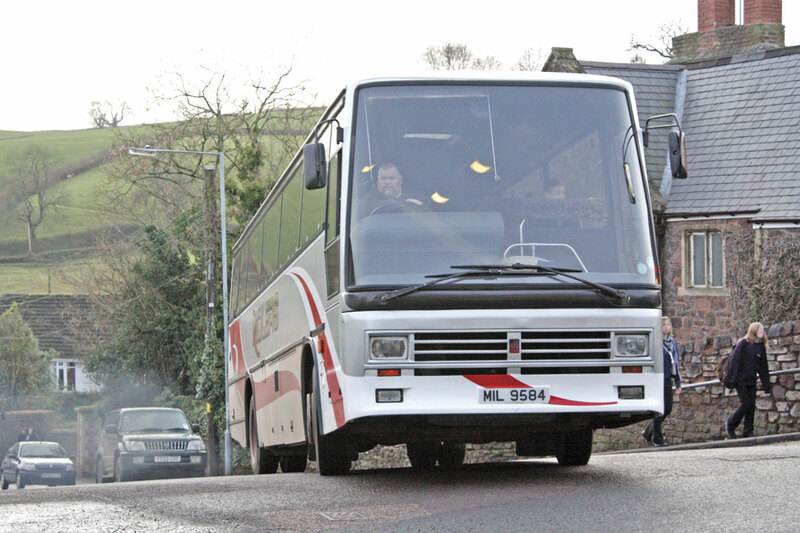 Among the Javelins were 11m long examples which are ideal for the narrow rural roads locally. Some are retained to this day because buying something suitable to replace them is virtually impossible. ‘For us it was a real sea change. Being used to Bedfords and the Ford R Series that would do 100,000 miles, coaches that would do a million miles were quite something,’ said Gary. The investment encouraged expansion of the private hire side but aside from this it was much as before with a blend of school contracts, twinning trips, National Express work and jobs for other operators, notably Berrys in Taunton including Newmarket Holidays trips. ‘We still have a close relationship with Berrys to this day,’ said Gary. In the early 2000s it continued to get busier with an increasing amount of income being derived from the Minehead area. To keep up with this and maintain the vehicle standard necessary, more late used acquisitions arrived including a six month old Plaxton bodied Iveco EuroRider ‘because Coach Europe made us an offer we couldn’t refuse.’ An ex-demonstrator, it was probably the newest coach the company had ever owned at the time. Gary thinks it is a ‘surprisingly good’ coach, ‘the only problem with it is the range change eight-speed box which some drivers don’t like; nor dealers when you want to part exchange.’ With the Iveco a new style of livery application featuring a stylised R was adopted, with vinyl used rather than the previous paint. Acquisitions were additions rather than replacements and as the fleet size increased to over a dozen it became more difficult to house them all at Dulverton. At the time the licence authorised a maximum of 15. 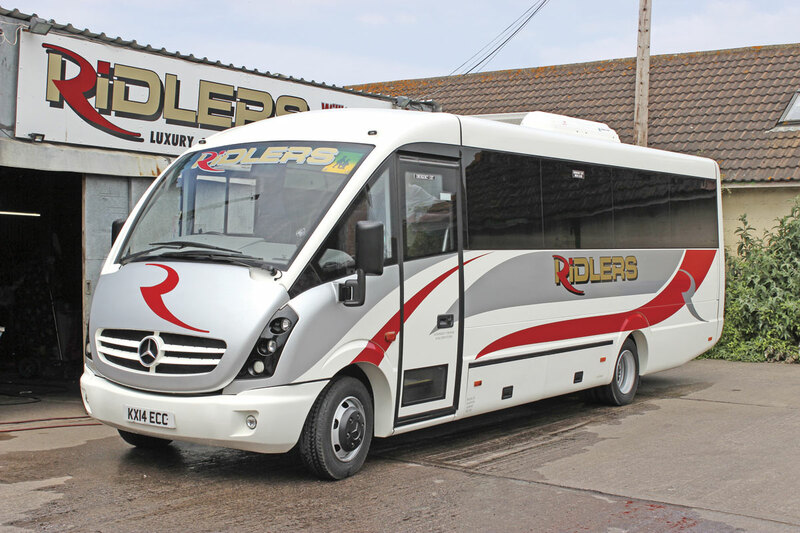 It was therefore fortunate for Ridler’s that Bryants, a longstanding operator based at Williton, 18 miles from Dulverton but only seven from Minehead, sold out to Webberbus, and eventually in 2009 their depot became vacant. This was leased, providing space for nine vehicles as well as a small maintenance facility and mess room. With the vacuum left in the area the workload continued to expand and additional school contracts were also acquired taking the total operated to 12. 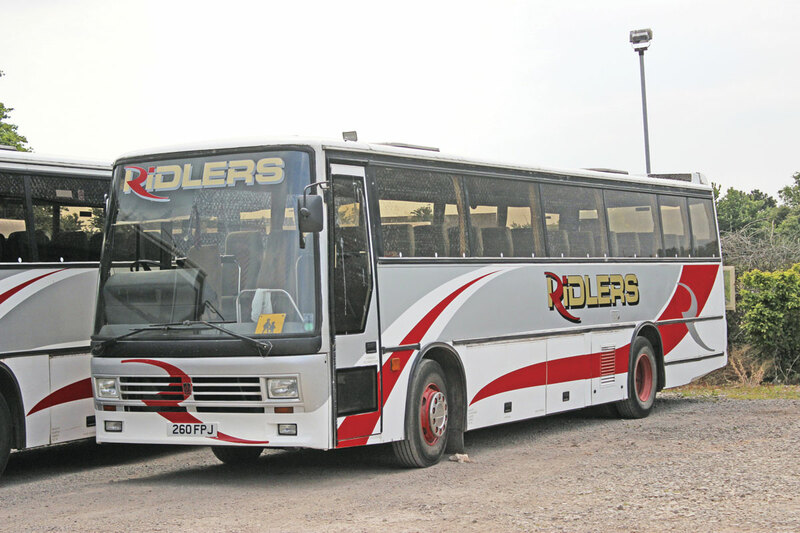 With the additional space the operators licence was increased to the current authorisation of 30 coaches, though today the fleet only numbers 24. 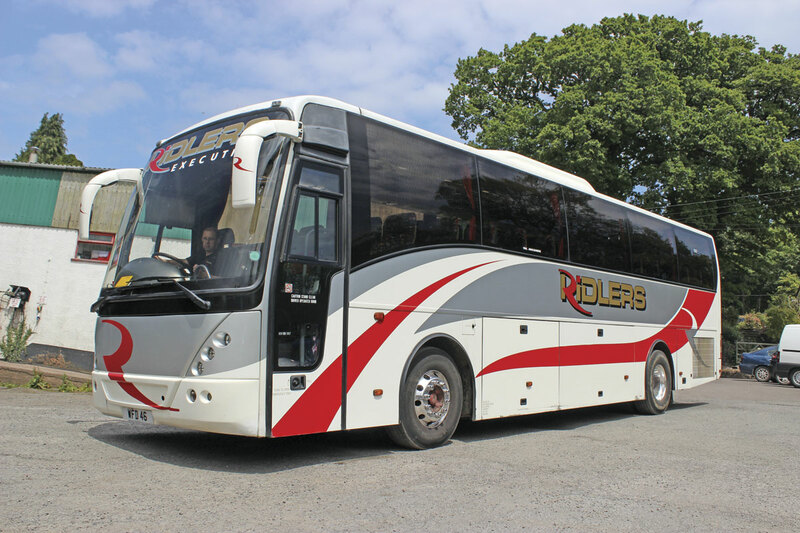 With more better quality work from tour companies and private groups in Minehead another upgrade in the fleet was required, resulting in the purchase of three secondhand Van Hool Alizee T9 Scanias. 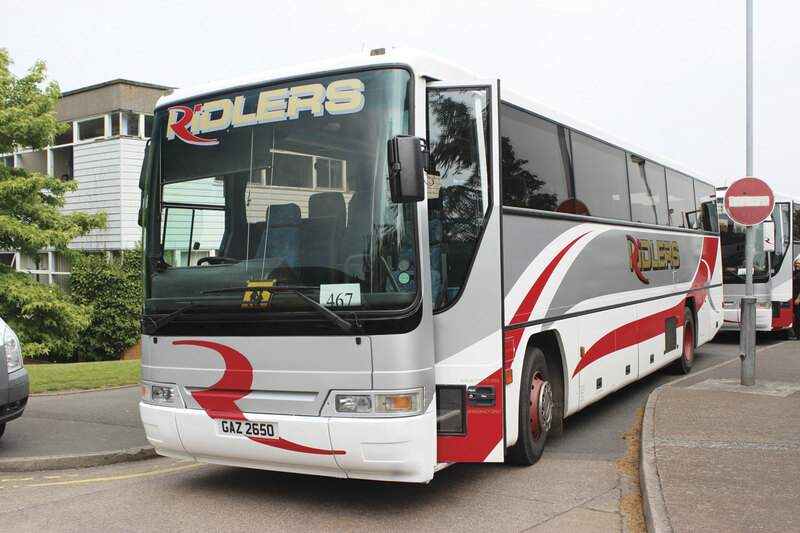 Another acquisition was a Scania Irizar Century, acquired as a 49-seat executive but subsequently converted to a 30-seat team coach with kitchen and tables, primarily for the use of Yeovil Town Football Club. John Ridler had retired in 1999 and died in 2006. One of the Scanias is named after him. 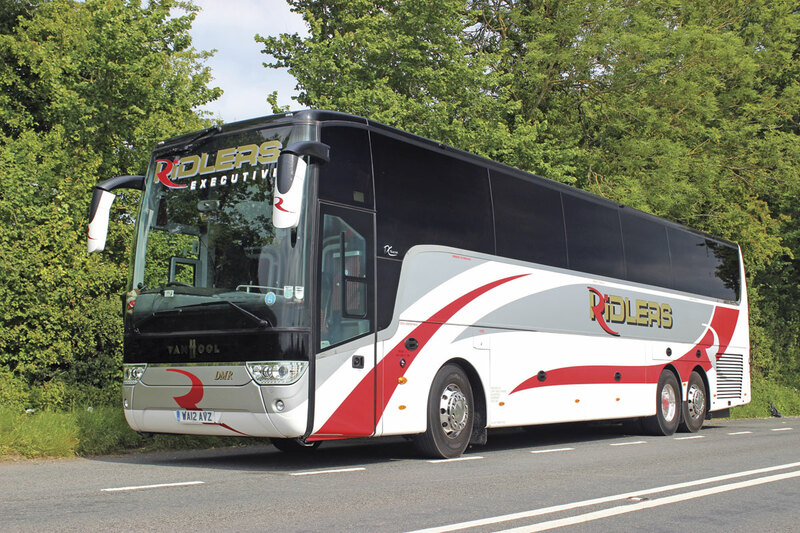 Doreen followed him in 2011, but not before she had shared in the process of ordering the company’s first ever brand new coach, a 13.5m MAN powered Van Hool TX16 Acron that carries her initials on the front in her memory. 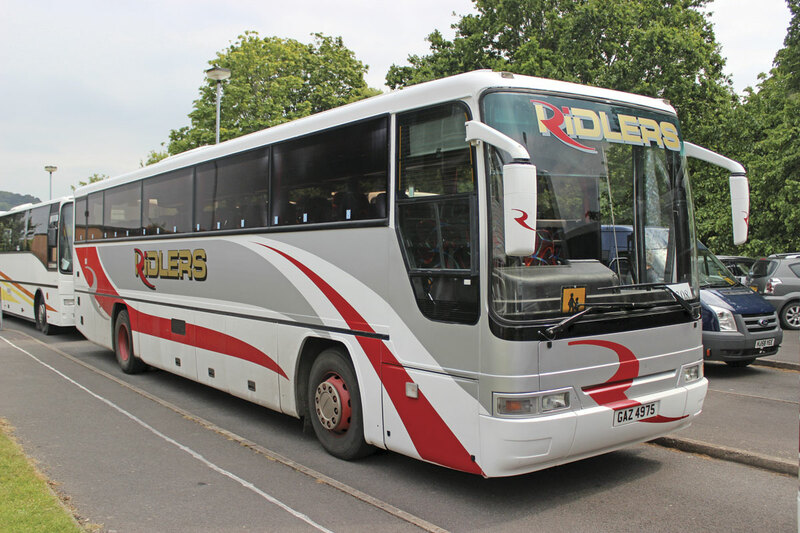 The company had always had a good relationship with Allan Vaulter at Moseley in the South, indeed he had travelled to school on a Ridler’s coach. ‘I also felt sorry for Phil McKay the salesman who could never sell us anything,’ joked Gary. 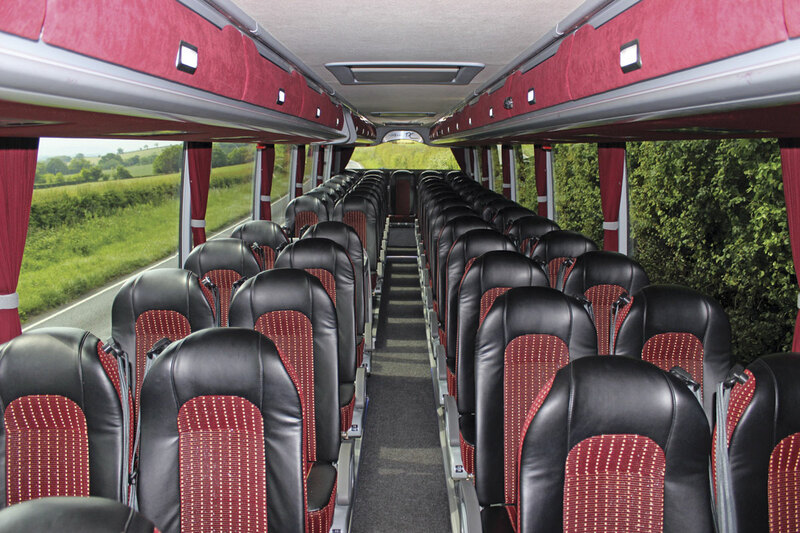 Delivered in June 2012, it has a 53-seat executive specification but is dual certified for 57 seats. Like the rest of the fleet, it is allocated to a specific driver, in this case Ian Garbutt, who looks after it fastidiously. Gary professes himself absolutely delighted with it, praising in particular the quietness of the MAN engine. 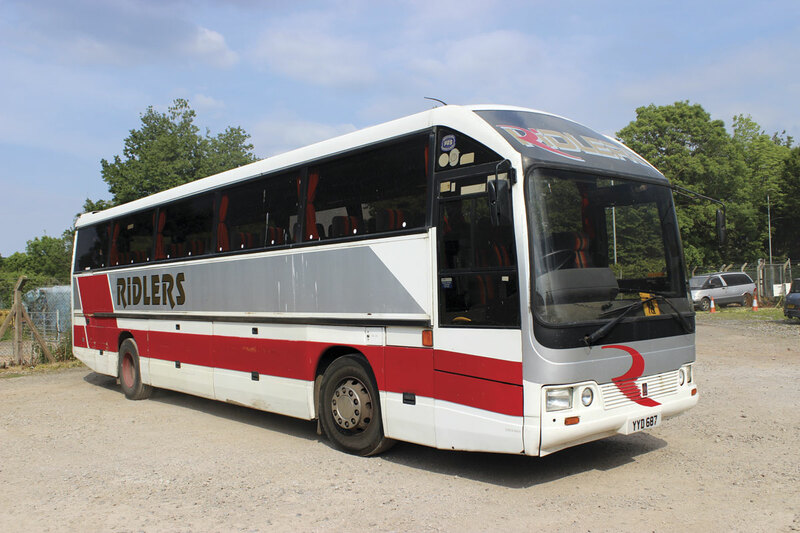 He has also been very pleased with the Volvo B12 and is actively looking for other similar coaches. ‘I’m really disappointed that Volvo and Van Hool no longer work with each other,’ he said. At the other end of the scale, the smallest vehicle operated is a 16-seat Ford Transit and there is also a pair of Toyota Optimos with 22 and 24 seats respectively. 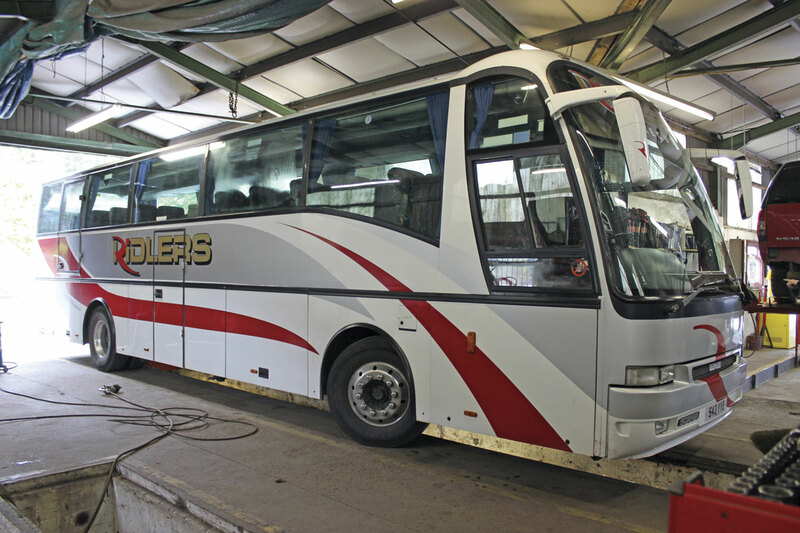 In addition, one of the very last Plaxton Cheetah bodied Mercedes-Benz Varios has been leased from Dawsonrentals. 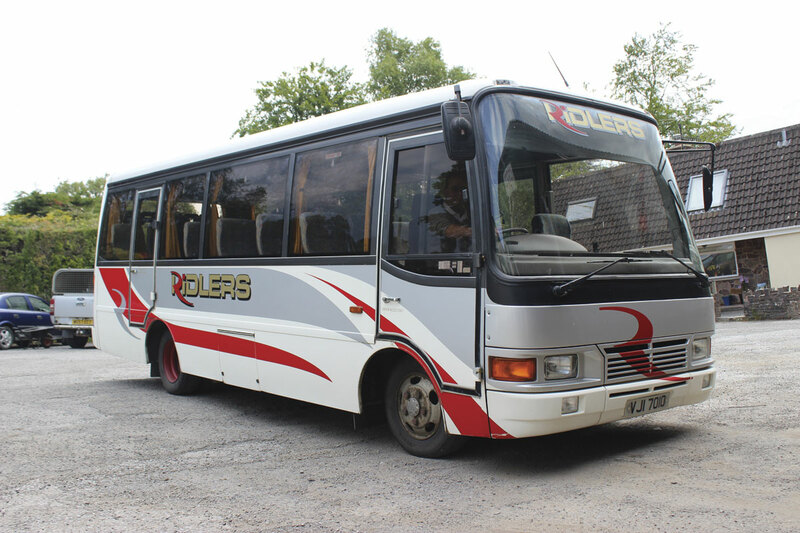 A 29 seater, this 14-plate coach arrived in November last year. In the past, one of the more unusual small coaches operated was a Caetano Algarve bodied, rear engined Iveco 315 that was not especially successful. The Transit and the Optimos work on school contracts, while the Cheetah is for smaller capacity excursions and private hire. 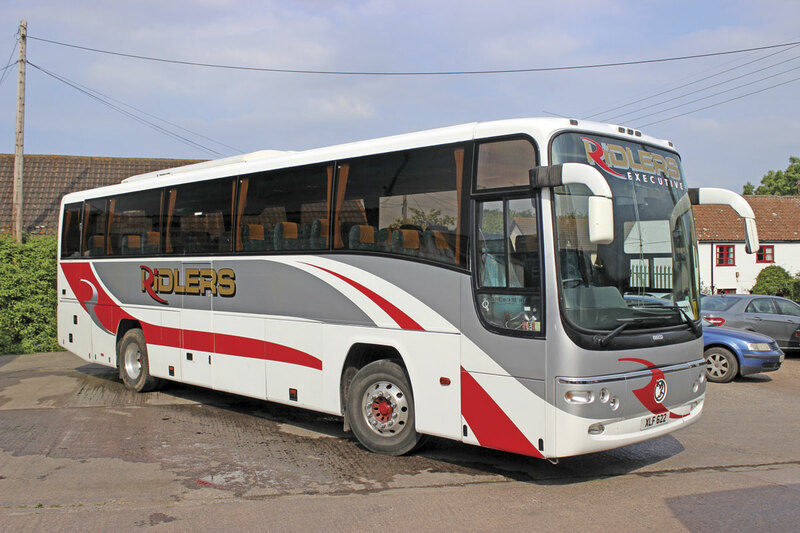 No more top end acquisitions have been made since but investment has continued in modernising the contract fleet, mainly with later Plaxton bodied Javelins, some of which have been up-seated from 53 to 57. Gary pointed out that the company had never owned a B10M, though one was borrowed briefly. ‘I’ve no idea why we didn’t have one,’ he says, ‘we bought Tigers in the day.’ The last of the Tigers, a Paramount 3500, is currently up for sale. Growth around Minehead has reached the point that it accounts for most of the company’s work and with the former Bryant’s site bursting at the seams, an additional yard was taken on 18 months ago to provide extra parking for 15 coaches. It is used mainly for the school fleet. Looking after the growing business has seen changes in the organisation of the operation and changes to the structure. 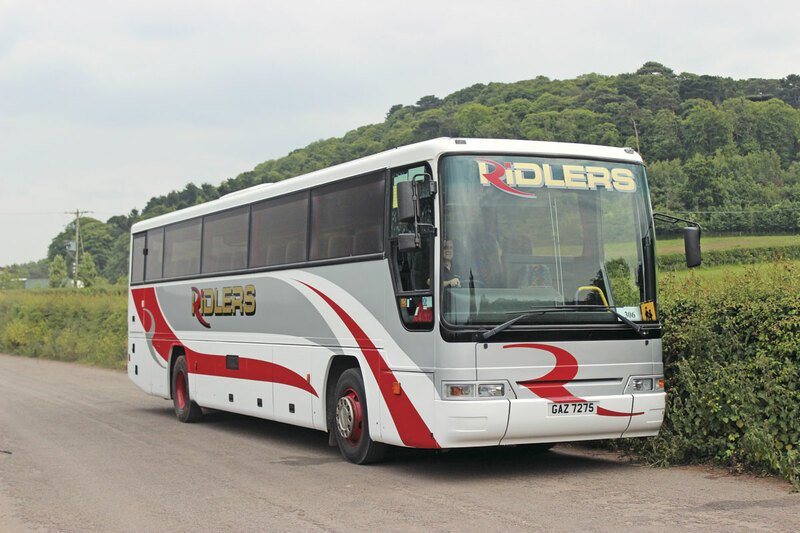 Ridler’s Coaches became a limited company in 2002. Gary is the MD, Sarah, his wife is also a Director and six months ago Transport Manager, Mark Jamieson, who has been with the company for 13 years after previously spending 17 years with Berrys of Taunton, has also become a Director. Mark is in charge of the day to day running at both Dulverton and Williton and splits his time between them both. He is ably assisted by Ann Kelland who is also a Transport Manager. In addition, Ian Garbutt (who drives the TX16) is also the Maintenance Manager at Williton. At Williton there are currently ten full time drivers and five part timers. In contrast, there is now only one full timer at Dulverton though with Gary, Mark and all of the mechanics able to drive, there are enough people to cover the work. Staff turnover is very low. ‘We try to look after them and treat them properly,’ said Gary. 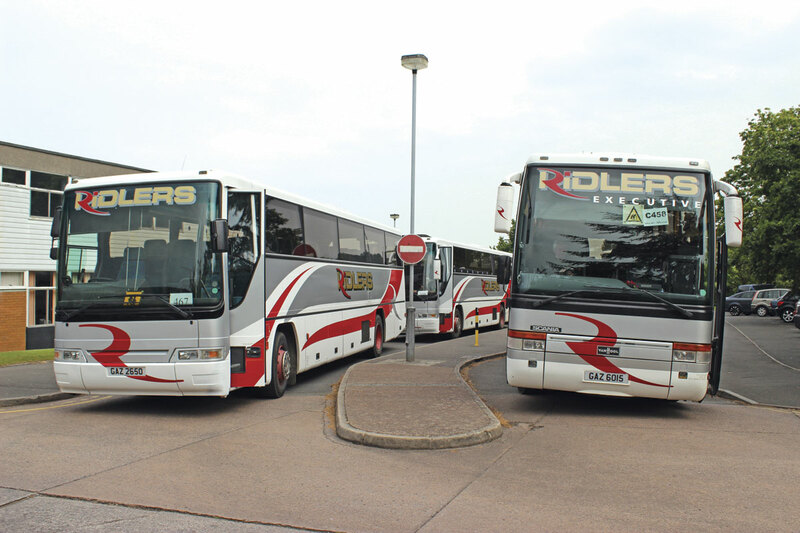 Although a stable workforce means that it is not a big issue for Ridler’s, Gary is critical of, ‘how difficult and expensive they’ve made it to recruit and train drivers these days. I don’t understand it. It seems overly complicated to me,’ he said. Gary does have other interests. In March he and Sarah became grandparents to Clara, Christopher and his wife’s first child, and in September Thomas and his wife are expecting their first. Babysitting duties loom. ‘Grand children are like buses: you wait ages and then two come along together.’ He is also into motorbikes, especially late 1960s and early 1970s British ones and has a small collection as well as a new Triumph Sprint.